all glued together to hold their idle state…..…..but did you know???? neighbor’s newspaper, that’s the time to do it. That way, when you criticize them, you’re a mile away and you have their shoes. he will sit in a boat and drink beer all day. Good judgment comes from bad experience. 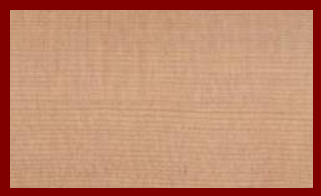 There are a number of factors that determine the tonal properties of wood for a classical guitar neck. 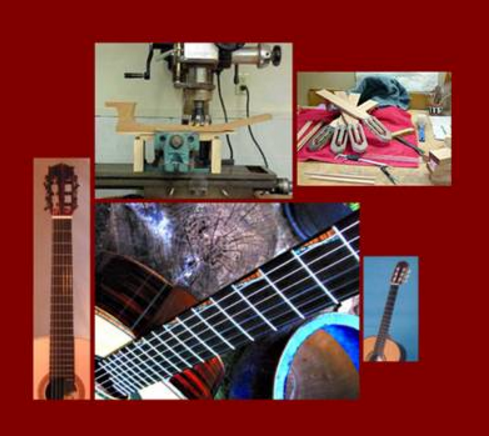 The wood can respond differently in the hands of different makers and/or different models of guitars. Distinctions can be subjective. Materials of the neck and fret board along with the quality of each individual piece can have a significant bearing on tone. Honduras Mahogany necks help to create a warmer tone. 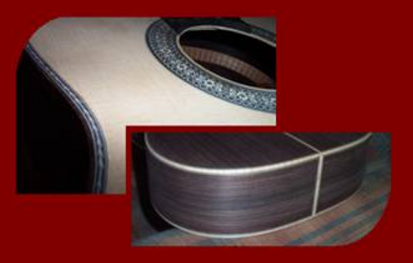 Brazilian Rosewood adds sparkle and ring. 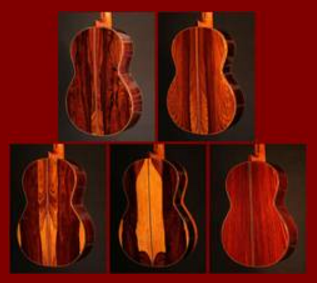 Indian Rosewood can help fatten up the midrange. Maple necks can create bright tone. 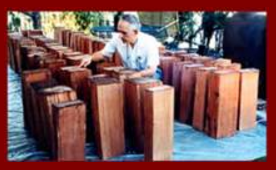 Spanish Cedar & Figured Koa are often used. The grain of the neck should be straight and consistent. Irregular grain, susceptible to humidity changes, can cause performance problems. The neck may be reinforced with carbon fiber rods, ebony reinforcement strips or equipped with an adjustable truss rod to maintain the proper relief demanded by many of today’s players. 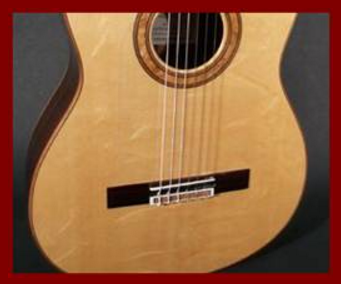 The shape & width of the neck are probably the most personal element of a classical guitar. They affect how easily one can move on or up and down a neck. Two methods of cutting the neck out of a block of wood. The uppermost part of the neck, above the fingerboard nut, holds the tuners on a guitar. The headstock is slanted to increase string tension to the fingerboard nut. Makers know the size and weight of the headstock can alter the balance, tone, clarity & sustain of the guitar. The shape & size of the crown of the headstock can be a trademark. The Headstock veneer is a thin slab of wood added to the top of the headstock to hide the end grain appearance created by the slant of the headstock. 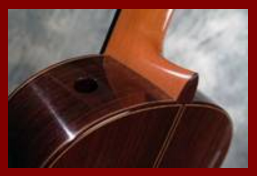 Wood used for the veneer can be highly figured as in flaming koa or plain ebony to highlight an inlay or the unique shape of a headstock. An improperly wound string is the number one culprit of tuning problems. 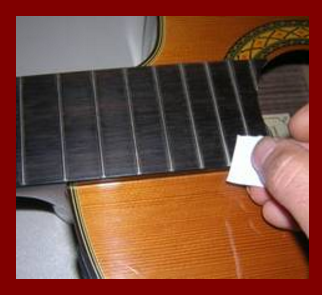 If the string is not properly wound around the tuner post it will slip (See How to change Classical Guitar Strings.) 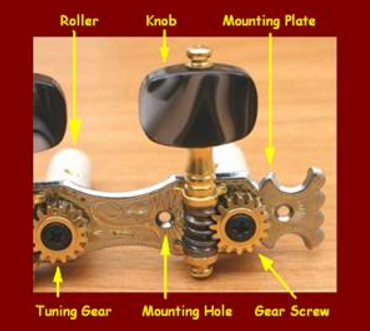 An attempt to rotate the roller (instead of the knob) of a set of tuners (of any quality) is impossible without stripping its gears or bending the mounting plate. Tuners don’t slip, strings do. Knob– Often plastic, ivory, bone or ebony. Mounting Hole– Spacing often varies with different brands. Gear Screw– First place to look when tuner rattles. 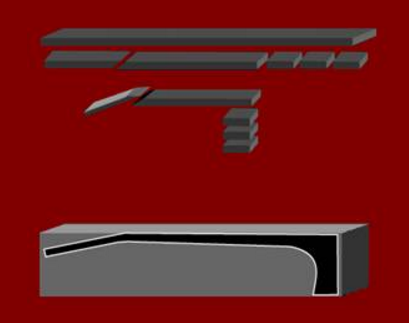 Mounting Plate– If the plate bends the gears will break or slip. Tuning Gear– Gears with zero play make for better tuning. 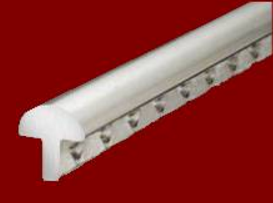 Roller– Usually plastic, Sometimes ebony or aluminum. 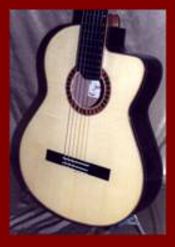 The fingerboard of the classical guitar is generally ebony. Ebony is hard, durable and black in color. An alternate wood for the fingerboard is Indian Rosewood. Rosewood is softer than ebony with varying browns in color. The grain of the fingerboard should be straight and consistent. 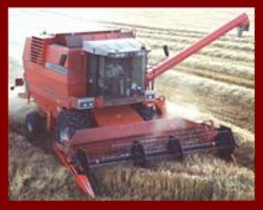 Irregular grain, susceptible to humidity changes, can cause performance problems. 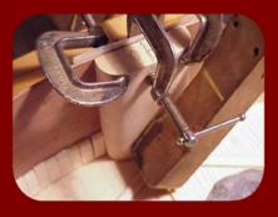 The fingerboard can be rubbed with boiled linseed oil on a cheesecloth. 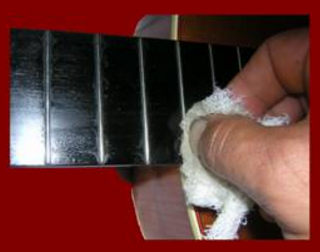 This will remove any playing grime on the fingerboard. Also, this will moisten the fingerboard to prevent cracking. Follow with plain cheese cloth to remove remaining linseed oil. The heel has both function & beauty. It acts as a truss transferring the string tension to the back of the guitar. It can act as a marker for the upper positions of the fingerboard. The shape & size of the heel can be a maker’s signature. Two methods of building a heel out of a block of wood. 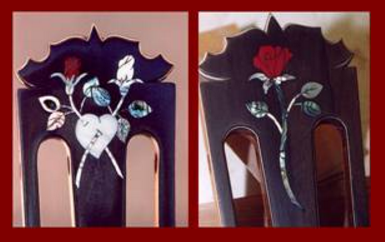 Inlays add beauty and personalize a guitar. 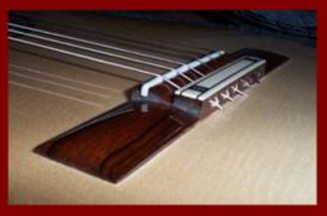 The Fingerboard Nut, located at the top of the fingerboard, determines string spacing and string height at the first fret (measured from the top of the fret to the bottom of the string). Factory made fingerboard nut slots tend to be on the high side. Due to differing climate conditions, this is done to ensure that the guitar won’t buzz when it reaches its destination. Bone-Dense & durable but somewhat inconsistent. Less porous bone more desirable. Fossilized Ivory-Denser than bone. White in color. Fossilized Walrus Ivory-Dense and a very good conductor of vibrating energy. Increased volume & sustain, better note-to-note clarity & improved tone. Varying brown in color. Tusq®-Man-made material quickly gaining in popularity for increased volume and sustain. White in color. Graphite-Popular on electric guitars with tremolos for reduced string binding and breakage. Black in color. Plastic-Factory equipped on cheap and moderate priced guitars. Functional but many are hollow, soft and/or spongy with reduced sustain. White in color. 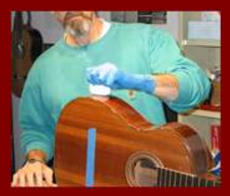 Corian®-Synthetic material used on many Martin® guitars. Density more consistent than bone. White in color. Brass or Aluminum-Not very common or recommended. Brass or Aluminum in color. Ebony-Most often seen on earlier instruments. Black in color. Zero Fret-By duplicating fret material, thought to sound closest to a fretted note, but lacks dampened effect of the finger. Color matches frets. 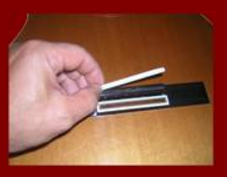 The height of the fingerboard nut is a variable measurement. Height can vary with saddle height, string tension and diameter, angle of right hand attack, dynamic range of a player or style of player. 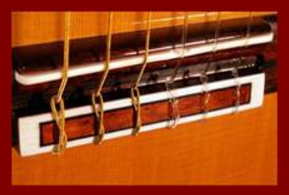 The lower the string height the easier it is to barre a chord in the first position, but pull-offs on the first fret can be compromised at too low of height. 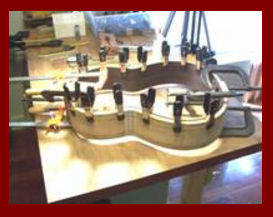 One method of determining slot height that will take these variables into account is to first adjust the bridge saddle to a desirable height with the strings to be used. With the string pressed to the first fret, measure the string height at the second fret (measure from the top of the fret to the bottom of the string). Multiply the measurement by two. 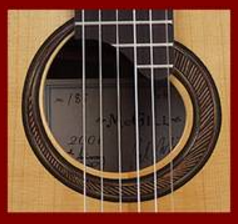 The new measurement will represent the string height at the first fret of the open string. because the spaces become the focal point. with varying spaces to string centers. This spacing performs well & looks good. then as slots are filed, slightly altering the spacing. The width of the slots (A) are determined by the diameter of the strings. 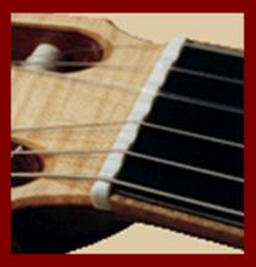 An undersized slot can cause a pinching of the string creating tuning problems. An overly wide slot may cause the string to vibrate in the slot losing volume, balance, tone, clarity & sustain. The slot should follow the shape of the string at the bottom and slightly widen at the sides. The width at the “wings” (B) of the fingerboard nut is roughly half of dimension C, but B may vary to accommodate the taper of the fret ends. 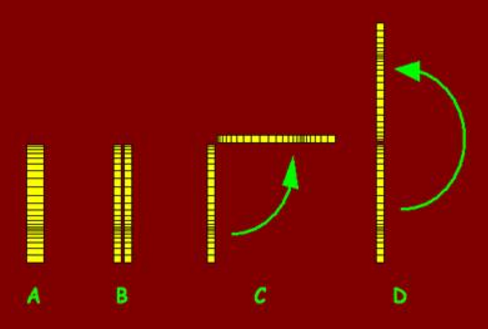 Slot height (D) is typically 1/2 the diameter of the widest string. 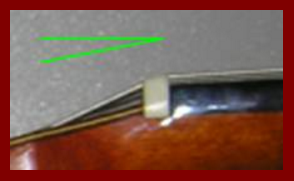 Typically the top of the fingerboard nut is parallel to the plane of the headstock. 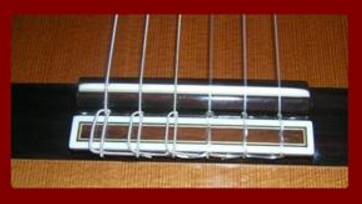 The bottom of the string slots repeats this angle with its edge closest to the fingerboard very pronounced. A poorly shaped edge at this point would cause a loss in volume, balance, tone, clarity & sustain. The edge of the slot closest to the tuners is less pronounced and slightly rounded toward the top of its corresponding tuning roller. 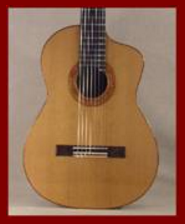 The top of the classical guitar is most commonly made of solid book-matched spruce or cedar. Sitka Spruce has a high strength-to-weight ratio. 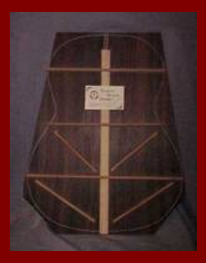 It is an ideal soundboard, especially for aggressive playing styles and/or large instrument sizes. Spruce ages well, is harder and possibly more durable than cedar, gives a crisp, more focused sound, and provides excellent treble response. 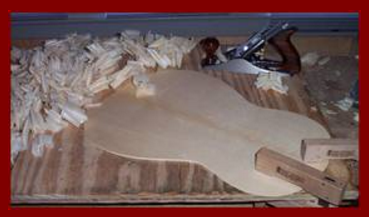 Spruce tops require a longer break-in time than cedar. Light blonde in color. Engleman Spruce is not as stiff as Sitka, but popular because of its appearance. Works well on smaller bodied instruments because of its lower stiffness. It has a beautiful sheen much like the European spruces with less contrast between its growth rings. Usually looks whiter than Sitka. Western Red Cedar is not as stiff as the spruces, which makes it ideal for lower tension or smaller bodied instruments. It has a warmer tone with excellent bass response and will produce a mature tonal quality more quickly than a spruce top. Color varies from light reddish to a light chocolate brown. 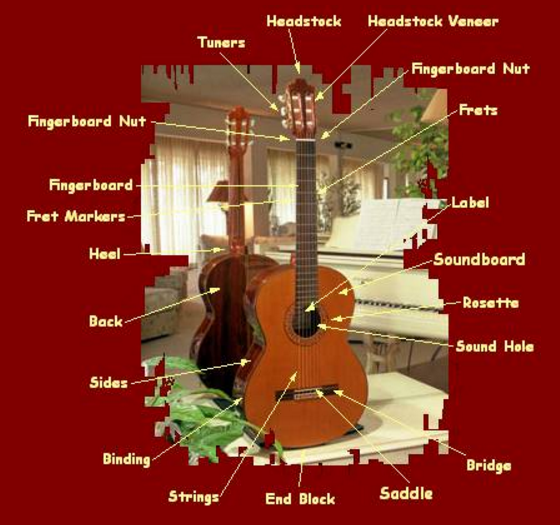 A soundboard has two purposes on a guitar, one as a stable anchor for the strings, and the other as the vibrating unit with which to move air (produce sound). This dual purpose makes stiffness such an important quality. Too much stiffness will dampen the tone. With too little stiffness the top will distort. Along with strength, wood is chosen for its appearance and consistency. 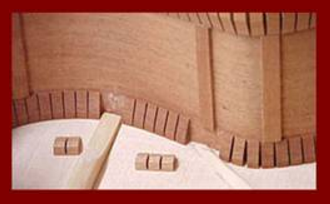 The soundboard grain should be straight, parallel and consistent with tight annual rings. 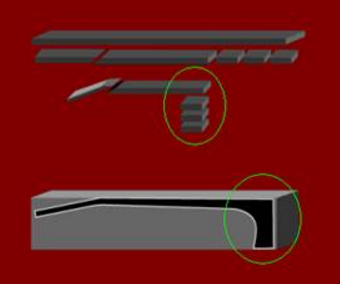 These characteristics add stiffness which helps the builder have more control in the final outcome of a guitar top. Some tops have a “silky” appearance (Soft grainy lines running perpendicular to the top.) Some makers like this and some don’t. If silk is present it should be present throughout the entire top. 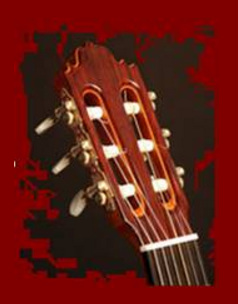 Another feature up and coming on classical guitar tops is “Bearclaw”. Bearclaw (like it sounds) looks like a bear used a tree to sharpen its claws and left nonsymmetrical small waves in the grain. Once considered inferior because of appearance, it’s now sought after because of its increase in density. 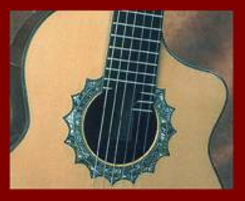 Bearclaw tops have become popular on bluegrass guitars and may soon be seen as an alternative in Classical Guitar construction. A consistent and even color is desirable for higher grade guitars. 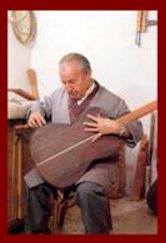 Guitar makers use a grading system to differentiate the quality in wood. Master Grade is awarded to one in a hundred (or more) tops (very rare). Master Grade is the best of the best. 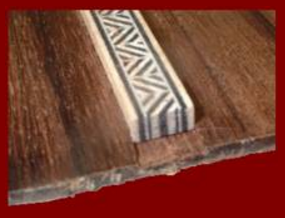 AAA is the second highest awarded for stiffness across the top, straight grain, quarter sawn, even color and consistent annular ring spacing. AA is given for slightly wider and/or inconsistent ring spacing or mild color variations. A is given for lack of stiffness, inconsistent ring spacing with visible cosmetic flaws. There are many factors that contribute to the overall sound of the guitar top. Factors can include internal inner braces, thickness of material, pattern and shape of the instrument, type of finish, and type of strings, but a good piece of wood is a good start. Traditionally the Back & Sides of the Classical Guitar were made of solid book-matched Rosewood, Mahogany or Cypress, but today’s builders have opened their horizons to a wide variety of choices. Macassar Ebony Book-Matched before Jointing. A vibrating guitar top creates sound. 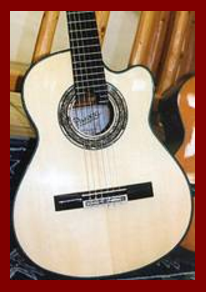 The air displacement, through the Sound Hole, is what amplifies the sound. Making the hole too small reduces the displacement and lowers volume. Too large a hole reduces velocity and in turn also lessens volume. 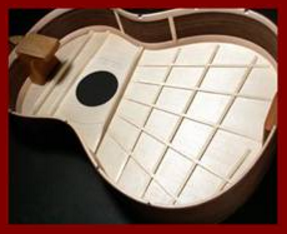 The ideal size of a Sound Hole can vary with the size of the sound chamber. 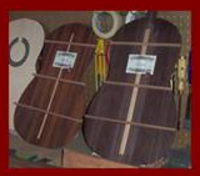 Sound Holes are not limited to a particular site or number. 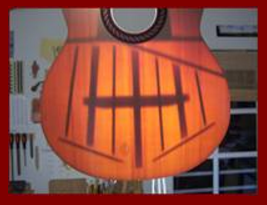 The Tornavoz is a conical tube beneath the soundboard that extends toward the back of the guitar. For more on the Tornavoz see Tornavoz. The rosette serves several purposes. 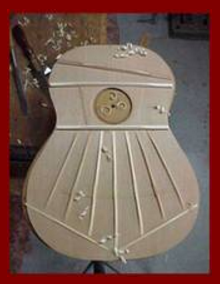 It acts as a reinforcement to prevent cracking at the end grains of the sound hole area of the top. It also acts as a visual focal point to the beauty of the guitar and, by design, is personal to its maker. 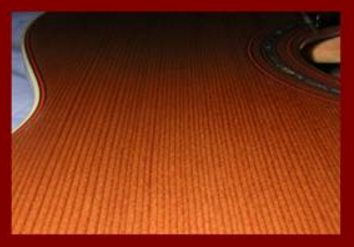 One of the areas on a guitar where a maker can truly express their artistic talent is the decoration surrounding the sound hole. The time consuming and meticulous intarsia found on the guitars of the great masters like Romanillos and Torres offer us a slight glimpse into the creativeness and spirit imbued in their instruments. Rarely are two examples exactly the same, yet often the work is readily recognizable and even copied. Rosettes are created from thousands of tiny pieces of wood, arranged in a specific pattern to achieve a design that is both aesthetically pleasing and unique. The uniqueness of the hand made rosette far exceeds the mass produced, and the designs can be manipulated according to the feelings and judgment of the maker for each individual instrument. I feel that guitar making is a contemplative and deeply personal craft – and I seek to imbue my guitars with spirit and life. 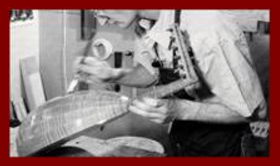 A guitar maker presents himself to the world through the quality and creativeness of his work. I take a personal interest in every guitar I make on every level, and it stays with me. Every guitar I’ve made reiterates to me who I was and what I felt at the time in a very specific way when I’m able to see it again. The small details, though they may go unnoticed upon a cursory glance, truly have a connection to the personality of the maker. For these reasons I have spent the past two years experimenting with and refining rosette designs until I finally had a design that fulfilled my vision for my guitars. I’ve worked at length with an extremely talented sculptor in developing a sense of aesthetics that is refined and complicated, yet appears simple and effective. Most rosettes are made from a mosaic of veneers of various colors glued together to create an attractive pattern. While in most cases I prefer the traditional approach I have given a lot of thought to the construction of the classic Romanillos rosette and chose a method inspired by it. The difference is that instead of gluing veneers together to create a design made up of tiny squares of the same shape, this method requires different pieces of wood to be of different sizes and shapes to execute the design. 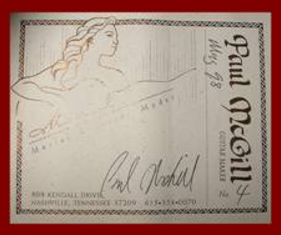 This rosette is new for 2004 and is the standard for my latest guitars. It is an interwoven design made of only natural woods – nothing dyed. 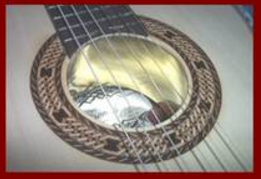 It is achieved by creating a log from which the pieces of the central motif are sawn and inlaid in a circle just slightly larger then the circumference of the sound hole. Later, decorative borders are added to complete the design. 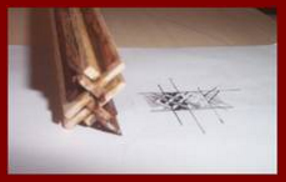 When finished the rosette contains more than 3300 individual pieces of wood. The Edge Binding protects the end grains of the top and the back. It also doubles as a decorative trim at the borders of the guitar. 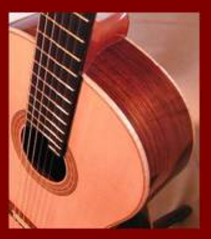 The Binding on a Classical Guitar is generally made of layered wood. 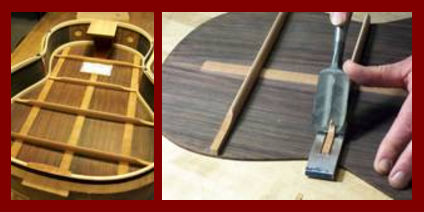 The Backstrip, usually made of wood, will match or compliment the guitar’s edge binding. It will also reinforce the center seam of a book-matched back. 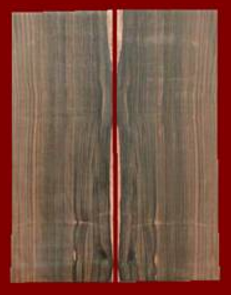 The Neck Block is often made of mahogany and along with the neck, supports the book-matched back, top & sides. 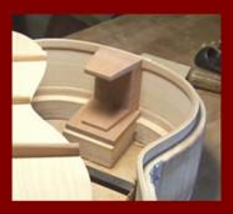 One method of attaching the neck to a Classical Guitar body is the use of a Dovetail Joint. It holds well and can be detached during future guitar repairs. This Neck and Block combination is cut from one piece of wood. It makes a very strong attachment but can be a nightmare to repair. Generally made of spruce, braces add stiffness to the top. 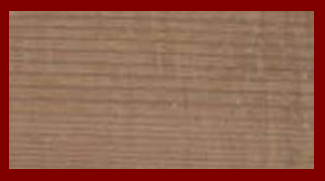 The wood chosen is very straight grained running the length of the brace. add tremendous stiffness to the back. The Bridge Plate adds strength to the top under the bridge area. The straight wood grain runs perpendicular to the top. 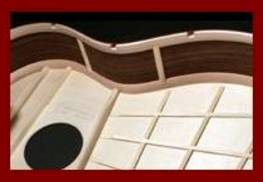 A strip of wood is added to the seam of a book-matched back for reinforcement. 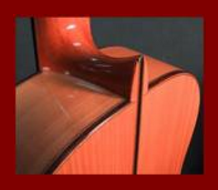 Guitar Kerfing (guitar lining) is tapered strips of wood glued around the inside seams of a guitar to add strength and stability where the sides meet the top and back. Kerfing has spaced slits that render the wood strip flexible. Linings don’t have to be slotted. Solid pieces of wood can be used in their place. Both do a wonderful job. The End Block supports the book-matched back, top & sides. Through the saddle, the bridge transfers the vibrating energy of the string to the top of the guitar. a strong cosmetic veneer is added. This adds character to the bridge and also prevents the strings from marring into the bridge. Typically made of bone, the saddle transfers the vibrating energy of the string to the top of the guitar. The bridge saddle is not glued to the bridge, but rather held in place by the tension of the strings. 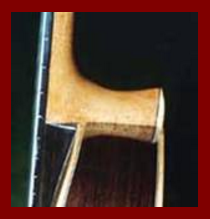 The height of the saddle is determined by the guitar’s neck angle, therefore it is not measured itself but rather measured for an optimal string height at the twelfth fret. Traditionally the bass strings are higher than the trebles, but crossover players are setting their heights more equal. High -Too much torque on the top. Top will distort. Bridge may lift or split. Medium -Allows for adequate adjustments thru the seasons. A few materials used for a bridge saddle. Choices of brands, alloys, tensions, tonality, durability and feel can vary as much as the make and models of guitars themselves. 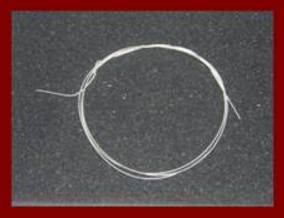 An increase of silver in a string may improve tone, but shorten durability. 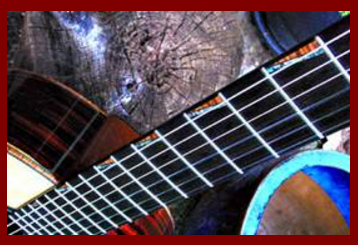 Scale length, string height, style of attack or even hardness of frets can alter ones opinion of strings. A choice of strings may be decided by the music itself. High tension strings might be chosen to perform Morning (by Grieg) because of its/their dynamic range, while low tension strings may be more suited for Prelude in G Minor (by Rachmaninoff) to achieve a driving, raw, gritty sound and ease left hand fingerings. 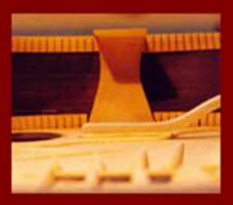 A Cut-a-Way body allows for easier access to the upper areas of the fingerboard. and the approximate date the guitar was built. There are many glues to choose from for building and repairing. 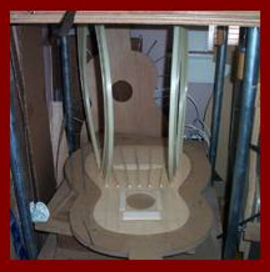 Traditionally, hot hide glue is used in making classical guitars. 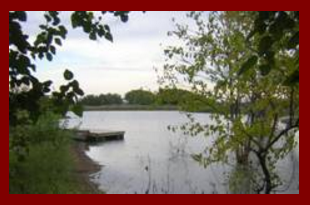 It has good strength and is fairly easy to separate for repairs. Titebond is slightly more aggressive and withstands weather conditions better. Contact cements are used to adhere plastic to wood and epoxies are sometimes used as a last resort in some repairs. Another family of adhesives gaining acceptance for certain applications is Cyano-Acrylate Glue (super glue). French Polished Shellac- French polishing is a method of applying finish to wood by hand with a cotton pad. 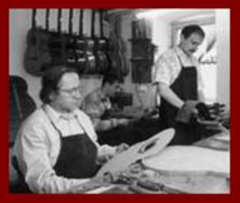 Most of the fine classical guitars being hand made today are French Polished. 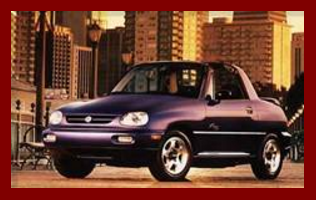 It is a highly-prized and desired finish for both its visual and tone enhancing characteristics. The texture, luster and color of the wood are enhanced under a French polish finish. It is thin and flexible and produces the clearest and most natural sound. Multiple polishing sessions are required over many weeks to achieve the best results. The finish dries to the touch almost immediately but can takes months to fully cure. Even though it is thin and flexible it is not very protective against even minor physical abuse. 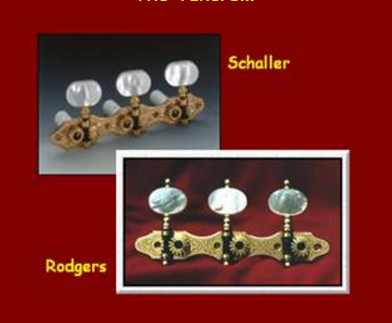 Oil Finish- Most oil finishes available are either a linseed oil or a tung oil. These oil finishes are actually varnishes and have an appealing natural luster. They are easy to use and produce a hard, thin and flexible finish, although not as protective and durable as a lacquer finish. Nitrocellulose Lacquer- Used since the 1920’s, a quick-drying solvent-based lacquer that contains nitrocellulose. A very hard yet flexible, durable finish that can be polished to a high sheen. With age, yellows, producing a desired vintage look. 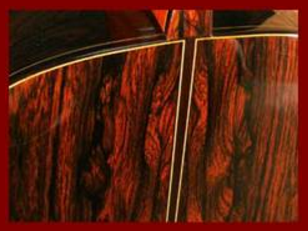 Combining French Polished Shellac & Nitrocellulose Lacquer- Many guitar makers are now combining both. They are using French Polish for the soundboard because of the finish’s tonal characteristics and Nitrocellulose lacquer for the rest of the guitar for its durability. Acrylic Lacquer- Originally used on cars, it is similar to nitrocellulose lacquer, but dries quicker and harder. With age, does not produce the vintage look. Water-Based Lacquer- With personal health and environmental concerns the long-term trend is moving away from solvent-based finishes. In response, many manufacturers set a goal to create a lacquer with all of the positive characteristics of current solvent-based lacquers but without the hazardous, toxic solvent base. Water-Based Lacquer is environmentally friendly and produces “acceptable” results.